Point of discussion for the movie/3 part pilot that started it all. In the beginning, we see the Battlestars Acropolis, Atlantia, Columbia, Pacificia, Triton, and Galactica (we actually only see five battlestars, and all mentioned except for Columbia, which is later stated during Ice Gun that it was destroyed at Cimtar so it must have been there). Now, Apollo and Zak while on patrol find 1000 Raiders, which is an overwelming force. Only Galactica gets all of her fighters away, with the other Battlestars only getting small numbers of ships in the air. My question is two part. One, if all the other Battlestars had gotten their fighters away, would it have mattered? That would have been 450 Vipers outgunned two to one. Second, if Galactica wouldn't have bailed out in the middle of the fight and sped off towards Caprica, would that have changed anything? Isn't there a line along the lines of "We can beat these guys with ten to one odds!" between Zak and Apollo? I took that to be a bit of hyperbole, but that Vipers could certainly fight at odds of two to one or more and expect to win. So they'd at least have a fighting chance against a thousand Cylon ships if they could launch all of theirs. Now I may be remembering more from the book than the actual movie here... but whatever. As I remember it, the outcome of the battle is pretty much irrelevant. The Cylon strategy was to send their fighters with tanker support, and their role was to keep the fleet busy whilst the base ships attacked the Colonies directly. The Cylons didn't really need to destroy all the Battlestars, they just had to keep them there so they couldn't interfere. If the Cylons lost every fighter in the process then what can the Colonial survivors do next, really? With their home bases gone they are no more threat, and the Cylons can rebuild fighters relatively easily. Similar thing with Galactica, really. If she stays she can offer more firepower in a fairly useless cause. Pick off more Cylon ships at best, get destroyed with the others at worst, accomplishing little either way. But even going home doesn't really achieve anything. She's only one ship, she's not going to stop the Cylon fleet singlehanded even if she arrives in time. I suppose the only sensible thing to do would be to match what the Cylons did... leave your fighters behind and sacrifice them to keep the Cylon fighters busy, and go home but with the whole fleet... try and defend the colonies, or at least some of them. 1 - We've seen time and again in oBSG that strategically, one Viper is easily a match for two Raiders... even considering the fact of Starbuck's and Apollo's writer's fiat in dogfighting ability. So yes, having c. 450 Vipers in the battle would have made a huge difference. 2 - No. Having one battlestar return to Caprica wouldn't have really swayed the outcome. Mark wrote: My question is two part. One, if all the other Battlestars had gotten their fighters away, would it have mattered? That would have been 450 Vipers outgunned two to one. Second, if Galactica wouldn't have bailed out in the middle of the fight and sped off towards Caprica, would that have changed anything? To part one, as has already been mentioned, yes. Especially as there's evidence that there were far more than just five or six Battlestars at the peace conference. To the second one, unlikely but possible. While the loss of a random battlestar is unlikely to change matters, the loss of the Galactica is a bit different. She, unlike the others, was already at full alert at the start of the action, so she would have been in a much better position to a) defend herself and b) act as a coordinating ship for the defence of the entire fleet, controlling both her own Vipers and those of the others as they launched piecemeal until the others could get up and running. 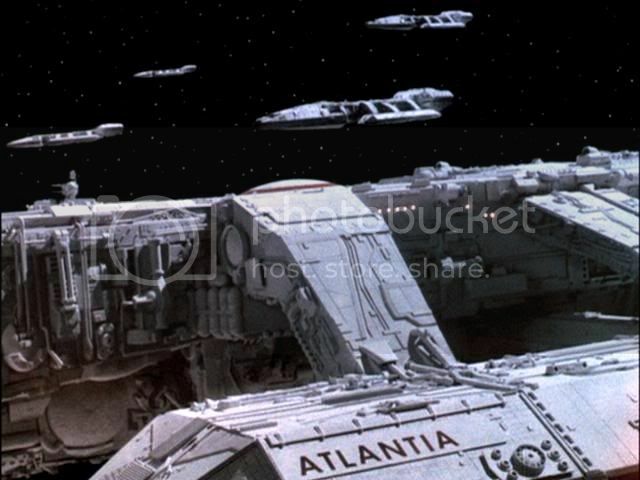 There's also the effect on morale to consider - Galactica's withdrawal occurred immediately following the destruction of the Atlantia, and would have compounded the shock of that loss. On top of that, if you go by the novel, Adama was easily the best commander in the fleet, and the sight of him doing a runner cannot have done much for the confidence of the other ships in the fleet. As I said above, there were far more than five or six battlestars present. My assessment is that the colonial fleet at the battle of Cimtar probably consisted of nine battlestars, with the Atlantia and the head of the formation and Galactica being the rightmost of the three ships immediately astern of her in the first image. The other two of that trio are ahead and to starboard of Galactica, as seen in the third image, and the remaining four are out of sight to the Atlantia's starboard side. Thoughts? Well, my own two sense worth is this. If President Adar actually hadn't been a complete moron, and launched ALL Vipers when the Cylon Raider fleet first appeared, I truly believe that while suffering heavy losses, just on their own, the Vipers could have eventually won. In fact, if the battlestars had assumed a broken formation, they Raiders would have been burning way more fuel getting from ship to ship, and in combat would have burned out all their fuel, giving the Colonials the advantage. Now, what I don't understand is this. Adama withdraws to Caprica, abandoning all of their Vipers and the rest of the fleet at Cimtar and for what? They arrived after the Colonies were pummeled, and the basestars were gone. What did he really accomplish? If he had stayed at Cimtar, he may have helped to save at least one other Battlestar, which would have dramatically altered their military state throughout the series. Nice screen shots Seafort, but I can't help but wonder if were just not seeing different angles of the same fleet. Well, I think the point is the fact that withdrawing to Caprica didn't accomplish anything... save, of course, the plot mechanism. Mark wrote: Nice screen shots Seafort, but I can't help but wonder if were just not seeing different angles of the same fleet. Of course we are - the point is that we're not seeing the same ships in each shot. We can't be - the differences in the formation between the first and second screencaps is enough to demonstrate that. Mikey wrote: Well, I think the point is the fact that withdrawing to Caprica didn't accomplish anything... save, of course, the plot mechanism. That said they didn't know that they wouldn't arrive in time. One would expect the Cylons to carry out both attacks simultaneously, but then the fighters launched their attack in response to being discovered, possibly before the planned time. So there was a theoretical chance for Galactica to make it back to Caprica in time to do some good. Had they took all the other Battlestars with them, and had they arrived a little sooner, things might have gone somewhat differently. Which is all circumstantial, based on very big "ifs." Even given that, my point was based on the question of whether Galactica, itself and solely, could have changed the course of events had she returned to Caprica. Which depends on more speculation - how big a force attacked each colony? One can only guess that the Cylon and Colonial fleets were evenly matched, else why bother with such a plot at all. 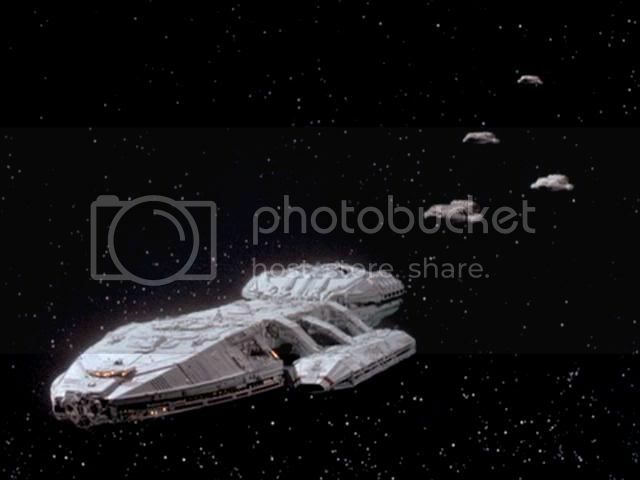 And the shots of the fleet that we see indicate the Colonials have less than one Battlestar per world, IF we see the bulk of them in our view of the fleet. Which means, the Cylon attack was probably one Basestar per colony or less, at least on average. I like Galactica's chances one on one with a Basestar, myself. If they had arrived at Caprica before the attack, I think they would have been able to fend it off. And yes, lots of if, if, if, there. Of course even at best it would be a temporary reprieve, because once the other colonies are destroyed the rest of the Cylon fleet comes to Caprica. But you'd buy the time for a much more orderly evacuation, and a much larger and better equipped and provisioned civilian fleet to escape with. In your first screen shot....we see five battlestars. Your assuming the lead ship is Atlantia, yet if you mark the position of the right most ship, you see later that THAT ship is Atlantia. Over her starboard side you see the other ships in the background. That is the only ship we know for sure of. Now, because when we see Adama's shuttle landing as he returns to Galactica, we see no other ships in the background as the approach from the rear port. Thus I'm speculating that Galactica was the lead ship. Later, after Atlantia goes boom, we clearly see three remaining battlestars as Galactica pulls away. Those numbers jive with the original five ship count. Also, if that were true, how did Adama assemble a fleet of ships from those outer colonies? I mean, the basestars were mobile, they had raiders, and still ships got away. Its as if the Cylons didn't understand what the humans were doing until they assembled the fleet as started running. 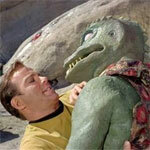 GrahamKennedy wrote: Which depends on more speculation - how big a force attacked each colony? I'm not even sure those "ifs" are valid "ifs." I don't recall (though it's admittedly been a long time) anything to indicate that the fleets were matched numerically; and judging by the general horror with which humans reacted to Basestars, I'm not sure they were matched tactically either. Further, even if a fully-complemented Battlestar was nominally a match for a Basestar, now we're talking about the case of a Battlestar which has exhausted its fighter wing running back to try and engage an attack on Caprica which comprises one or more un-fatigued Basestars. Mark wrote: In your first screen shot....we see five battlestars. Your assuming the lead ship is Atlantia, yet if you mark the position of the right most ship, you see later that THAT ship is Atlantia. Over her starboard side you see the other ships in the background. There's no way that a port side shot of any of the ships in the first image could produce the second image unless there were additional ships present. Since we can see a long way to starboard of all but the leading ship in the first image it's most likely that it's the one with additional ships to starboard. Now, because when we see Adama's shuttle landing as he returns to Galactica, we see no other ships in the background as the approach from the rear port. Huh? My last screenshot is of Adam returning - there are two other battlestars off her starboard bow. We see three battlestars in that particular shot. Mikey wrote: I'm not even sure those "ifs" are valid "ifs." I don't recall (though it's admittedly been a long time) anything to indicate that the fleets were matched numerically; and judging by the general horror with which humans reacted to Basestars, I'm not sure they were matched tactically either. Galactica took on and destroyed two base stars on one occasion, as I recall, and Galactica and Pegasus took on three. If there was a firepower gulf, it wasn't a big one and wasn't necessarily even in the Cylon's favour. Further, even if a fully-complemented Battlestar was nominally a match for a Basestar, now we're talking about the case of a Battlestar which has exhausted its fighter wing running back to try and engage an attack on Caprica which comprises one or more un-fatigued Basestars. But the Basestar would also have minimal if any fighters, given that the point of their attack was to send all their fighters with tankers to take on the fleet whilst the Basestars took on the planets. As it happened we did see some fighters used there, but likely a minimal token force given the strategy. And in any case, assuming you lose and die trying to defend the planet - so what? Is the argument that you might not win that fight so you shouldn't bother to try and save your home?Stay and fight a pointless fight against the Cylon fighters instead? 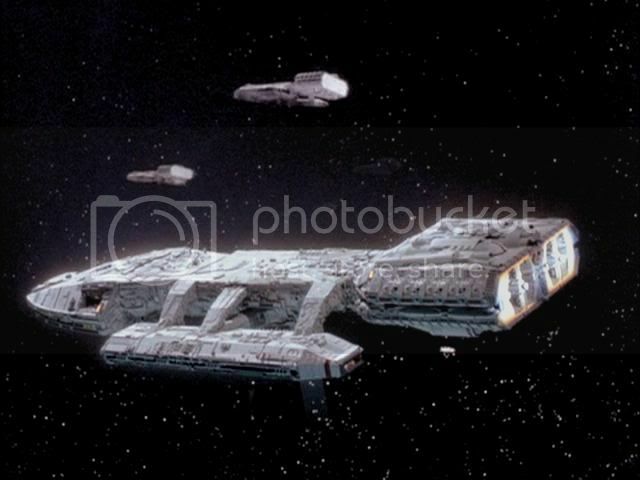 Moreover, battlestars are handily superior to basestars ship-to-ship - Pegasus, seriously undercrewed, destroyed two with only minimal fighter support after suffering extensive damage, and Baltar's reaction to Cain's run suggested that he was worried that she'd punch through the two he pushed forward as a screen and keep coming at him.